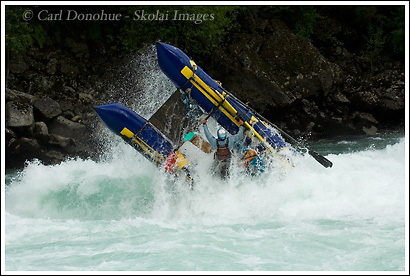 Cataraft flip in Mundaca, Futaleufu River, Chile. So, I’ll wrap up my Mundaca Series here. This is a safety boat, a cataraft, that runs the river ahead of the whitewater rafts, and gets set to pick up folks who might fall out of the rafts. Of course, that’s the plan, but if the cataraft flips, then the safety is shot. Generally, using a series of hand signals and keeping a watchful eye out, something like this will be communicated back upstream to let the guides of the rafts know they have no safety. In which case, they generally wait until the cataraft is either flipped back over, or they’ll continue on down the river, but run a more cautious line. I shouldn’t say there’s no safety – on a river like the Futaleufu, each whitewater rafting trip that runs down the river will take at least one kayaker per raft as safety. the kayakers stay close to the raft, generally, and are there to help drag swimmers out of a big holes and waves if they get stuck. So each raft has a a kayaker, plus at least one cataraft, and sometimes 2, per trip. A trip will usually have less than 3 rafts of clients – it gets too hard to maintain a safety balance with larger groups. I shot this photo towards the end of the season – as the water gets lower, sometimes rapids and waves get bigger. Mundaca really gets crunchy at mid-low water levels. The entrance to the rapid gets a little smaller, but the final wave, Mundaca, can get huge. Here Brent was running the cataraft down, with another beginning guide on-board, and got way outta control on hitting the first fusion wave. The wave rocked him around, pushed him into the center of the river where he lost balance, lost his grip on the oars, and was toast. The boat went completely vertical, you can see the 2nd guide in the bottom right corner of the boat, and slammed back down into the water. I’m kinda glad I wasn’t riding that one. This time of year last season we weren’t even running the river because the water level was too high, we had to wait until early January until the water levels were low enough to run commercial trips. The Futaleufu is an awesome river, and I hope it stays that way for a long time to come. There’s probably no better whitewater rafting river in the world: it’s definitely up there beside the Zambezi and the White Nile in Southern Africa. This entry was posted in Adventures, Chile, Cool stories, Rafting, Travel on December 27, 2007 by Carl D.
You certainly have a great collection of wipe outs Carl! 🙂 I can see why whitewater rafting is such a rush for so many people – you captured that ‘rush’ in your images perfectly! Thanks man, I appreciate that. And yeah, whitewater rafting, especially on a river like the Futaleufu, is amazing.